The subtle, soulful beauty of Michigan’s Northwoods fills writer Cindy Ross’ heart as she takes a four-day backpacking trip with her family on a gentle stretch of the North Country Trail. The first time I saw the sandy North Country Trail (NCT) high above the Manistee River, I was on a canoe trip, and we had just docked for a break. I looked at the blue painted blazes beckoning me to follow deep into the pine forest, and I vowed I’d be back—next time, for a walking adventure. One year later, we are here in Northern Michigan, sampling 50 miles of this 4,600-mile National Scenic Trail (NST). The National Scenic North Country Trail travels from Crown Point, in eastern New York to Lake Sakakawea State Park, in central North Dakota. The section we are hiking in Michigan is from Kalkaska to Old US 131, west through the counties of Kalkaska, Grand Traverse and then into Wexford. This beautiful stretch through the Pere Marquette State Forest is almost entirely constructed and off vehicular roads. It was referred to me by the Grand Traverse Hiking Club, a chapter of the NCT, which maintains 100 miles of this long-distance trail. My husband, Todd, son Bryce, and good friend Tim, will spend four days, three nights, walking and camping in this wild country, carrying everything we need in our backpacks. This will be our third trip to this beautiful part of Northern Michigan: first to cycle the Leelanau Peninsula, then to paddle the Manistee River, now to hike on the North Country Trail. We come all the way from eastern Pennsylvania to recreate here, which says a lot about Traverse country. Part of the allure for Todd and me is we are particularly fond of experiencing National Scenic Trails, even in small sections. We have enjoyed backpacking the entire National Scenic Appalachian Trail (2,150 miles), the Pacific Crest Trail (2,600 miles) and the Continental Divide Trail (3,100 miles). In 1968, Congress created the National Trails System Act, which now includes 14 trails, of which the North Country Trail is one. The NCT joined the fold in 1980. These trails are administered by the National Park Service. For us, hiking even a section of one of these great long-distance trails makes us feel a part of something bigger and grander. The NCT is marked primarily with 2-by-6-inch blue painted blazes on the trees. They also utilize brown posts made of Carsonite that display the official trail emblem and a strip that defines allowable uses. Side trails are blazed white. If you examine our 50-mile route on the elevation map for the next four days, you might fear mediocrity, for there is minimal elevation loss or gain—barely enough to increase your heart rate! But the topography is ideal for novices still getting their “backpacking legs” and leaves experienced hikers with more energy to notice beauty, and the beauty here is profuse and, surprisingly, hugely varied. Our white, sandy rope of a path meanders through towering white pines. The sky glows a breathtaking blue through the gaps in the canopy. Sleek, coal-black ravens call from the treetops. Dark, dense hemlocks right out of a Robert Frost poem cool the air. The late-summer forest floor is blanketed in sweet ferns, and alongside our path are more mushrooms than I have ever seen: electric yellow, scarlet red with white polka dots, creamy chocolate, some with little nibbles taken out by hungry forest critters. Not a single rock trips us up on the trail bed. All is smooth and easy on our feet—a sharp contrast to our rocky trails in the east. The refreshing breeze is constant, injecting energy into every living thing. The woods feel electric with life, animated. We skirt lakes, remnants from the ice age, where cattails stand like arrows. It looks like there ought to be a moose. When we leave the trail for a better photo by the lakeside, a pair of bald eagles rise and fill the sky with majesty. Ducks flush when we walk by and disturb their peace. We, however, are flooded with peace. We see no other humans all day until we arrive at our camp at the Sand Lakes Quiet Area. This 2,800-acre, specially regulated area within the state forest does not allow motorized vehicles. Sites are spaced far apart for privacy, and we make camp with our lightweight tents and cook a delicious meal on our backpacking camp stove. Coyotes serenade us with an evening concert. We’re covering 11 to 13 miles a day, fairly easy miles to traverse, even for inexperienced backpackers, but fatiguing enough to remind us of the joy of using our bodies and our muscles all day long. Most Lower Peninsula sections of the NCT are rated as easy as moderate. And the North Country Trail volunteers who primarily build and maintain the trail do a great job keeping it well groomed and open. After dinner, we write in our journals by lantern light, edit the day’s photos, fall into a hard, deep sleep in our sleeping bags. That is why we came to the North Country Trail, for the opportunity to walk our cares away. After only one day, we have been successful at leaving our lives behind. Day 2 finds us edging more lakes where strategically placed wooden benches invite us to unshoulder our packs and linger. The sandy shoreline gives us a peek into the local wildlife. A thirsty doe comes down for a drink, and her hooves sink deep in the sand. Three-pronged turkey tracks meander about. A line of raccoon hand prints show where the creature traveled to and fro, before heading in for a swim. In the afternoon, we, too, enjoy a foot-soak in freezing cold, cedar-lined Boardman River as well as a refreshing dip in Dollar Lake. We grab the opportunity to rinse off any trail dirt that might have accumulated on our skin. We leave feeling like new people. As we move across a handful of drainages to arrive at Twenty Mile Creek, the land has changed. We meander through a stretch of old growth called “Valley of the Giants,” where massive oaks seem to fling wide their arms as if to encompass the whole forest in an embrace. There is a hushed sacred feeling here, for we’ve truly entered a natural cathedral. These giants were saved from the logger’s saw when, back in the 19th century, much of Michigan was shorn of its white pines. They went to build the Midwest prairie towns, were frequently exported to European markets and also were responsible for rebuilding Chicago after the great fire of 1871 that destroyed thousands of buildings. Pine was light and could be transported downstream easily, utilizing the Boardman and Manistee Rivers. Squirrels consume pine cones like corn on the cobs, casting off the naked spent cones in a garbage heap. Honey sunlight makes the pine bark glow. Our path is cushioned by millions of soft pine needles dropped by the giants. We come onto a sign that announces, “Danger! Hill!” maybe for mountain bikers’ safety, but we barely break a sweat. Our third day’s gift is delivered by beavers. We hit their dam first—a towering sculpture of interlaced branches and packed mud. The dammed water behind the structure is smooth and swollen and deep, its surface glassy behind its blockade. The drowned trees are white, pale sculptures. Where are the artists, the construction workers who made this work of art? On break? Afternoon siesta? Their furrowed trails with deep drag lines are better traveled than our national scenic trail’s footpath. Trees, up to 6 inches in girth, have been felled in the direction of the dam. We wonder, coincidence, or purposely positioned? One tree in particular proved too wide to fell and perhaps it was abandoned in a fit of frustration—or reserved acceptance? We step around a dropped tree with the blue painted blazes on it—as if the beavers were showing whose woods these really are. Another 5-inch diameter aspen has been sectioned off into 16-inch log lengths. Little piles of chips lay next to each section of log. The calculations that were worked out in the animals’ brain astound us. We take off our packs and explore the area, learning so much about how these amazing wild creatures think and work. We’re tempted to call it an early day and camp nearby, returning at dusk to sit like statues and observe their work. On our fourth and last day, we follow old two-tracks, where mud-covered frogs sit unblinking in trailside puddles, camouflaged; then jump out as we pass. White spidery moss crunches under our feet and looks as if the land were covered in snow. The jeep tracks and old logging roads we follow are littered with acorns, rolling under our hiking boots as we walk … a promise for a satisfying winter for the wildlife who depend on them for survival. The massive white pines that once covered the forest were skidded out of the woods with oxen on the dirt roads such as these. In the winter, they were pulled by sleds over ice-covered roads to the riverbanks. The local loggers innovated a technique where they ran a sprinkler over the road on frigid nights. Come morning, the normally deeply rutted road was a sheet of ice, and the heavy sleds moved swiftly over them. Another logging invention, a type of Big Wheels, was designed by a local Manistee man, Cyrus Overpack. The 10-foot diameter wheels easily cleared the stumps and littered ground, enabling logging to continue without depending on snow and ice cover. Our trail skirts the edges of pine plantations of cloned trees, their grey texture appearing surreal in the shifting on/off switch of the sunlight and clouds. Through an aspen forest, the trail is covered with a carpet of yellow medallions like gold coins. We cross sunny meadows where tree islands stand separate and solitary with beds of ferns surrounding them, as if landscaped. Around Headquarters Lake, the trail is newly constructed and the forest floor feels like spongy pillows under our feet. High sandy bluffs appear, and beyond the lake’s other side, is the winding Manistee. We look down from our perch, and at “Ed’s Overlook” we can view three separate serpentine curves in the river in one glance. By an appropriately placed bench, a sign stating “Advice from a River” entices us to unload and sit a spell. Go with the flow, immerse yourself in nature, slow down and meander, go around the obstacles, be thoughtful of those downstream, stay current, the beauty is in the journey! Wind blows across the river’s skin as it makes its great gestural sweeps, and it looks as if it were alive, as if it were speaking the earth voice. A pair of canoes drift by far below us, and I’m reminded of our trip last year when we first learned of this national scenic trail. And when we reach the same pull out, where we slid our canoes out of the river, I know we have come full circle. Although there are 875 linear miles of the NCT across Michigan, the local Grand Traverse Hiking Club that is responsible for this section highly recommended hiking this particular stretch, and we can understand why. The trail has been captivating. The North Country Trail Association, as well as the Grand Traverse Hiking Club, are always looking for stewards to volunteer their time and energy in helping build the trail as well as maintain it. We are prime examples of the philosophy, “Build it and they will come,” as we drove 12 hours from the East to experience it. We are the richer for it. The 50-mile section of North Country Trail we hiked (beginning near Kalkaska and ending where the trail meets the Manistee River near Kingsley) is rated as a great break-in backpack trip for novices because the terrain is gentle and the path soft. The NCT website, under the Michigan tab, has suggestions and maps for day, weekend and longer hikes. Season: This trail is open year-round, but be prepared for winter camping November thru March, or even April. Late summer and early fall are perhaps the best times because summer high temps have moderated and bugs have diminished. Hunters may be in the area from September 15 through December 31. 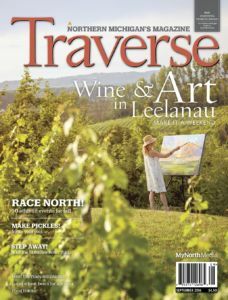 This North Country Trail feature was originally published in the September 2016 issue of Traverse, Northern Michigan’s Magazine.